The Ford Mustang is an icon across the world, and has been for decades, but the car is still a relatively unknown quantity on UK shores. Does the latest version now have what it takes to impress in Europe? 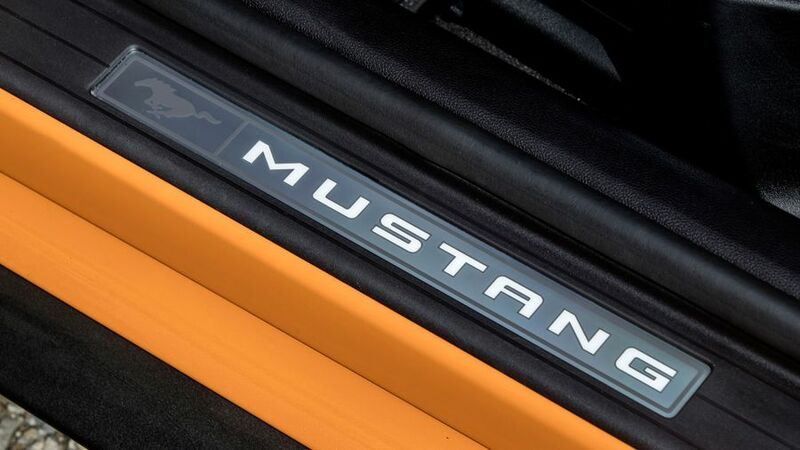 The Mustang has charms and flaws in equal measure, meaning it’ll be a very acquired taste. For some, the noise and pace of the V8 engine will be totally intoxicating, as will the attention-grabbing looks and the brutish image. And for those folk, many of the car’s flaws – such as the jittery ride, slightly unruly handling and eye-watering running costs – will only serve to enhance the experience. Meanwhile, all that same stuff will make other people run a mile. If you belong to the former group, just make sure you avoid the automatic gearbox, which might well ruin the whole experience for you, and do yourself a favour by spending the extra on the full V8 experience. After all, muscle is what a muscle car is all about. This version’s 31.4mpg is the best you’ll get from a Mustang, but that’s not really the point of a Mustang, is it? Interested in buying a Ford Mustang? To look at, the Ford Mustang is about as American as looking at John Wayne wearing a Stetson-and-spurs combo. The sheer size of the thing has plenty to do with that, and so do the gaping air intakes, chunky bumpers and brash details. And if you so desire, you can make your car look even brasher with one of the 11 paint colours available, not least the ‘Orange Fury’ one in our pictures. The 2017 facelift of the car brought a few design tweaks, along with LED lighting, for a slightly sharper, more purposeful look, but it still has that in-your-face thuggishness that commands attention everywhere you go. 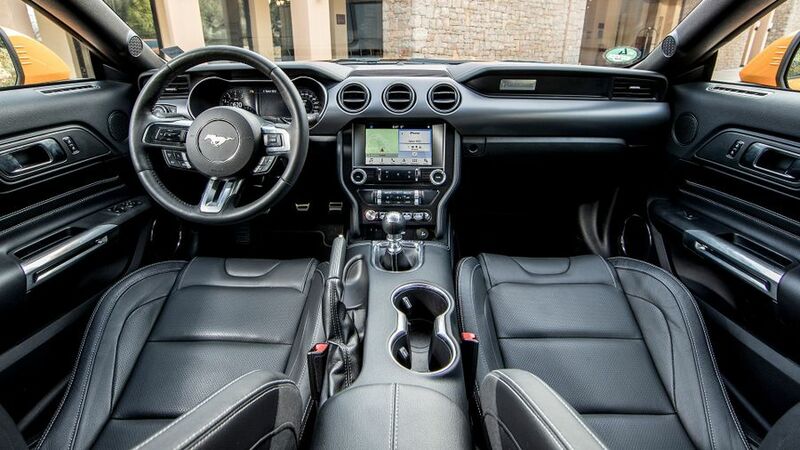 The Mustang’s cabin has a very American feel in that everything looks big, chunky and substantial. Unfortunately, it also means that the quality of the materials isn’t as posh as those you’d find in BMWs and Audis that cost similar money, but for hardened muscle-car fans, that won’t matter a jot. Things aren’t perfect in other ways, either. The driving position feels oddly high-set, and the touchscreen infotainment system looks and feels a little bit dated. The centre console and steering wheel are smattered with fiddly buttons that are hard to read, and the driving mode selector switch is truly infuriating (despite it being a rocker switch, you can only scroll through the modes in one direction, meaning you often have to scroll through the five you don’t want before getting to the one you do, and if you hesitate for a couple of seconds, it selects a mode you don’t want). Still, at least the all-round visibility isn’t bad for a car of this type, and the digital dials display lots of useful information in an easily digestible way. Not exactly the primary reason for choosing a large coupe, but even so, you want enough space and versatility to carry a buddy or two and their associated luggage. It just about manages that, but no more. The front seats are surrounded by enough space to accommodate a pair of tall adults, but the rear seats are too short on headroom for anyone taller than a mid-range teenager. It’s a bit of a shame because legroom actually isn’t bad. The boot is a very decent size at 408 litres, which is enough for a quartet of carry-on suitcases, but both the loadspace and the opening are rather shallow. 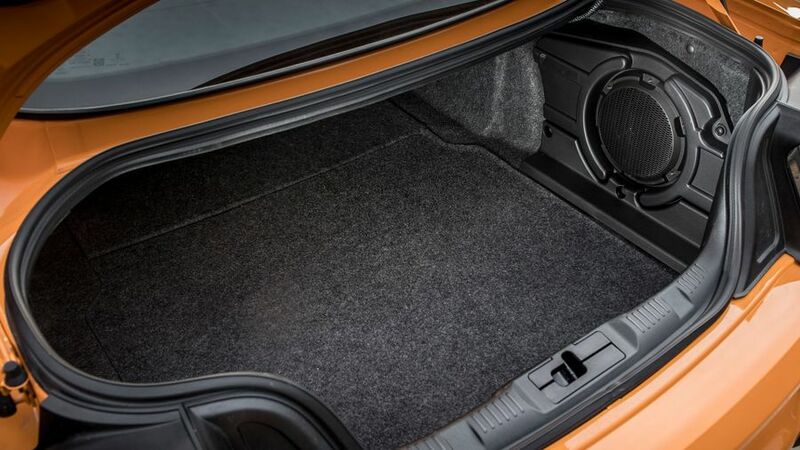 The rear seats are fixed, too, so you can’t extend the boot for longer loads. 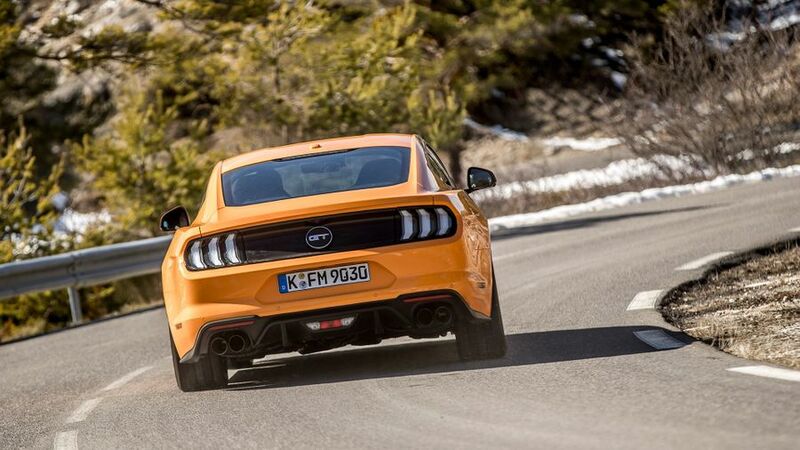 So far, we haven’t had a chance to drive this generation of Mustang on its standard suspension, only on the optional adaptive suspension that costs you quite a lot extra. It changes its behaviour according to which of the six driving modes you select. You can tell the difference between the softer modes and the harder modes, but to be honest, it doesn’t make a whole lot of difference to the way the car behaves overall. Whatever mode you find yourself in, the ride still feels rather choppy and jittery at low urban speeds, and although things improve when you’re going faster, it still doesn’t settle down as much as you’d like. It does do a good job of suppressing body lean in the bends, and there’s also plenty of grip to count on, which helps towards its agility levels. However, the sheer size and weight of the car mean it’ll never feel as nimble as smaller, lighter rivals, and the comparatively slow steering won’t be to all tastes, either. It’s important to remember that this is a muscle car rather than a sports car, and that all these foibles do give the Mustang an endearingly unruly, old-school character. However, it’s still true that, in purely white-coat terms, the Mustang is neither as comfortable nor as pointy as the fast European coupes it competes with. 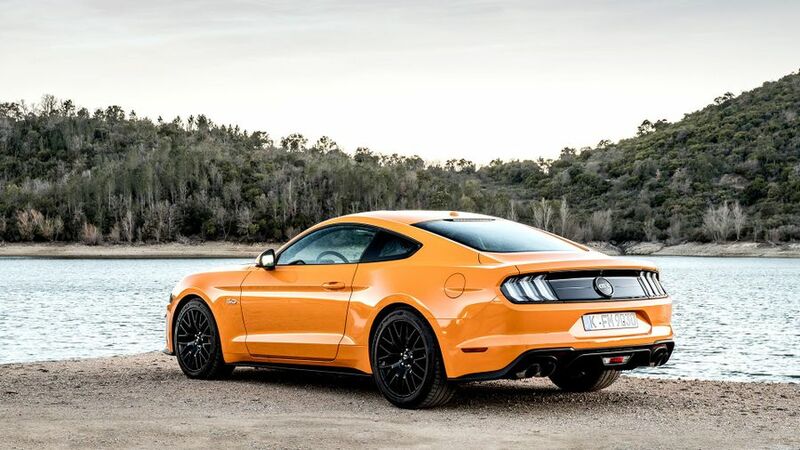 Two engines are available in the Mustang, a turbocharged 2.3-litre four-cylinder unit with 290 horsepower, and a thumping 5.0-litre V8 with 450 horsepower. Both come with a six-speed manual gearbox as standard, but are also available with a 10-speed automatic. The best – and most popular – combination is the V8 manual. The engine sounds fab, with a bassy gurgle kicked out from anywhere on the rev range, and with loads of pulling power constantly on offer, rapid acceleration is only ever an ankle-flex away. Rev it to its limits, and you’re treated to truly bombastic levels of performance and noise. The gearshift is a bit truck-like – heavy, notchy and long-throw – but it does give you ultimate control of what the engine is doing. The automatic ‘box doesn’t, and unfortunately, it rather ruins the whole experience. Even if you take gear-shifting responsibility yourself by tugging on the paddles, the shifts are so slow that when you shift down just before the entry to a corner, you’re at least three-quarters of the way through the bend before your desired ratio is engaged. And that’s if you get your selection right in the first place. With so many gears to choose from, you often find that shifting down one or two isn’t enough, and that three or four drops are needed to maximise traction. Things are just as bad when you leave the gearbox to its own devices, because the software is no better than your brain at deciding which gear is best for the prevailing driving situation. Judged in isolation, the 2.3 is absolutely fine for performance, with decent flexibility in most situations and decent acceleration available when you need it. It works better with the automatic gearbox as well, because the slowness of the shifts doesn’t have quite such a disastrous effect on your overall pace. However, with the Mustang being a muscle car, you might feel a little short-changed by the 2.3. Ultimately, it has nowhere near the noise, the pace or the drama of the V8, and in a muscle car – where it could be argued that the rest of the car is little more than a vessel in which to carry the engine – that drama is everything. The Mustang’s performance in this area very much depends on how you look at it. On the one hand, a European coupe of this size, with this much power, will cost you many, many more thousands to buy, making the Mustang look like something of a bargain. And, while depreciation on the Ford is heavier in percentage terms, the overall amount you’ll lose is lessened hugely by the lower purchase price, so on that score, you won’t be any more out of pocket after your average three-year ownership period. However, even the smaller-engined version only returns around 30mpg, while the V8 doesn’t do much more than 20mpg according to official figures. By any standard, that’s thirsty. Tax bills will also be hefty due to the correspondingly sky-high CO2 emissions, and bills for insurance, maintenance and tyres will also be very steep. Sure, a Mustang is never going to be a rational purchase, but don’t be seduced by the low price before doing all the other sums. Although the Mustang has existed in one form or another for decades, this is the first generation of the car to be offered for general sale in Britain, so UK-specific reliability data on the car is very difficult to come by. It doesn’t share much of its mechanical make-up with any other common European Ford models, either, so you won’t get many clues there. On the plus side, Ford ranks fairly highly in Warranty Direct’s rankings for manufacturer reliability, and because it’s a Ford, repairs and maintenance on your Mustang are likely to be cheaper than on an equivalent Audi or BMW. 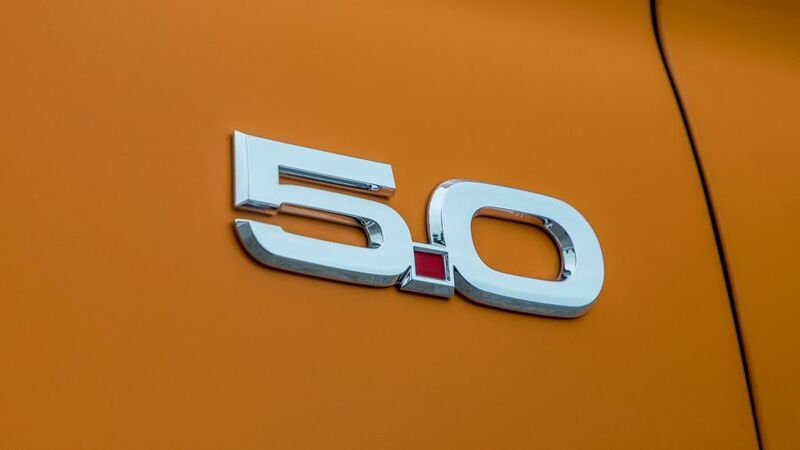 The three-year/60,000-mile warranty you get as standard is pretty much par for the course. The previous version of the Mustang scored just two stars in Euro NCAP crash tests, but was reassessed in 2017 following the latest round of updates including the addition of various electronic driver aids. Automatic emergency braking is standard-fit, as is lane departure warning and a lane keeping aid. 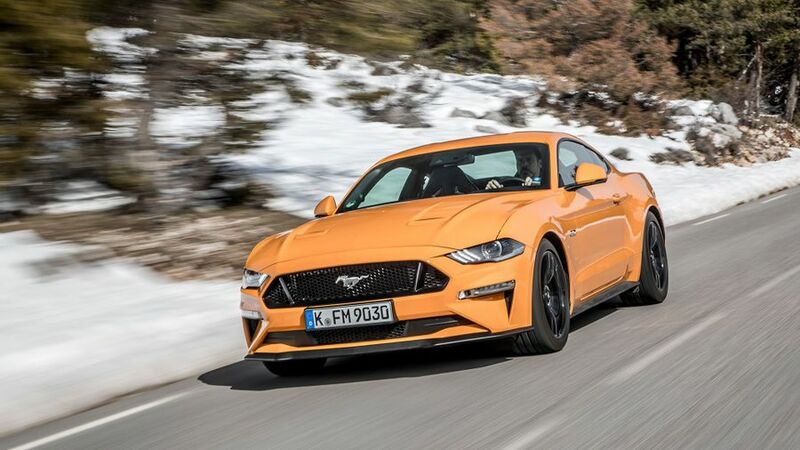 However, while that meant an improvement in the Mustang’s overall score, the car still only achieved a three-star rating, with those in the back looking especially vulnerable in a smash. 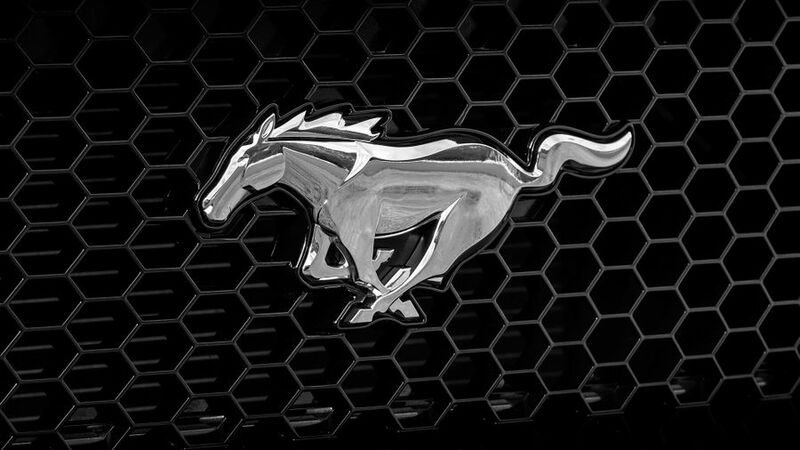 All versions of the Mustang come with a decent splash of luxury kit, which includes climate control, adaptive cruise control, keyless entry and go, automatic lights and wipers, powered front seats, rear parking sensors, a heated steering wheel and a nine-speaker stereo with integrated Bluetooth, DAB radio, reversing camera, voice control and Apple Carplay/Android Auto compatibility. 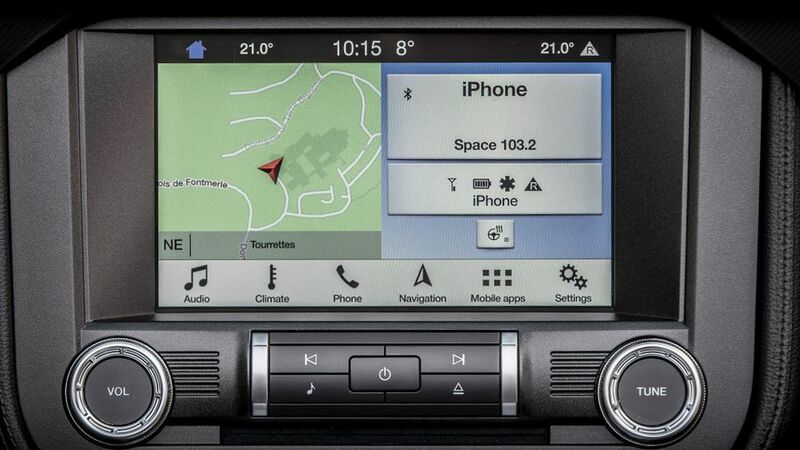 However, if you want integrated sat-nav, you have to upgrade your stereo by delving into the options list. In fact, that one of the very few optional extras available. The others include the adaptive suspension and seats that are both heated and cooled. The V8 gets a few visual upgrades compared with the 2.3, along with a few performance-enhancing gimmicks. That includes upgraded brakes, launch control, an active exhaust and a line-lock function that allows you to heat up the rear tyres by locking up the front wheels and spinning the rears. Because you want a Mustang. Despite its flaws, it’s a very likeable car thanks to the pace, the noise, the looks and the sheer brashness. 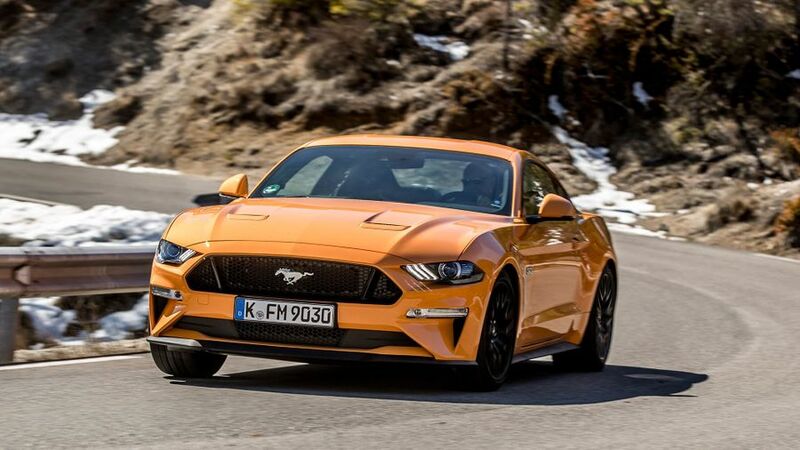 However, if you’re considering a Jaguar F-Type, BMW 4 Series or Audi A5 – all of which could loosely be considered rivals to the rather unique Mustang – we reckon the Ford would be very unlikely to tempt you away. That works both ways, though. If you want a Mustang, then any of the rivals mentioned will be way too civilised and boring for you. And if a Mustang is what your heart is set on, you’ll absolutely love it.